Let’s face it: For just about any parent who likes hip-hop, the phrase “hip-hop for kids” is filled with dread. Almost all of the attempts at it can be summed up by the word joke—either intentional (I give Elmo’s occasional rapping on Sesame Street, which is meant to be funny, a pass) or horribly, horribly not. So I once tended to view the few children’s hip-hop CDs I encountered with skepticism. My wife and kids loved Easy as much as I did, and it got tons of play around the house. We found ourselves eagerly anticipating his follow-up, though my own anticipation was tempered by a little knowledge of sophomore slumps. Now that he was established, could 23 Skidoo maintain his high standards without simply repeating himself? Perhaps most important, the beats and riffs he lays down are top-notch—catchy and addictive, they have your head bouncing in no time. Even here the new album pushes envelopes, though. While the cement is still the old-school hip-hop sound this artist clearly loves (think KRS-One), you also hear the influence of more modern names, especially in the song arrangements: Eminem, Jay-Z. Frankly, the eclectic nature of 23 Skidoo’s work is reminiscent of a lot of people, but if I had to pick one, it'd have to be Michael Franti, with whom he shares both positivity of message and an ability to rap effectively over many different styles of music. Like its predecessor, Underground Playground is an awful lot of fun to listen to, and if your kids are anything like mine, they'll be asking to hear certain tracks over and over. (It’s been getting serious car mileage lately for us!) And you won’t mind a bit. In fact, when you realize you’ve left it on in the car when the kids aren’t around, you might just leave it in there, and coast down the road with your head nodding. The all-star-musician benefit concept goes back years, of course, to George Harrison's Bangladesh concert, and a bit later the "Do They Know It's Christmas?" and "We Are the World" singles. But with the exception of a few giants like Pete Seeger (who's been doing benefit and charity work with his music his whole career, really), there haven't been enough big names in kids' music for such a thing to be possible in the genre. But Dean Jones (no, not the one from the original Love Bug movies—the frontman of kids' band Dog on Fleas), with a little help from the recent explosion of talent in this genre, has changed all that. Back in January, Jones desperately wanted to do something to help the earthquake victims in Haiti; he came up with the idea of a kindie-rock album to raise money. He joined forces with KindieFest cofounder Bill Childs, and the pair proceeded to put together an incredibly impressive roster of artists for the project. The result is Many Hands: Family Music for Haiti, a CD of 22 songs, one each from many of the top children's musicians working today. Seriously, if I were making a list of the genre's top echelon of talent, it would look a lot like this track list: Recess Monkey, They Might Be Giants, Frances England, Secret Agent 23 Skidoo, Jonathan Coulton, Dan Zanes, Gustafer Yellowgold, Elizabeth Mitchell...the list goes on and on. Even the venerable Seeger himself contributed a track! 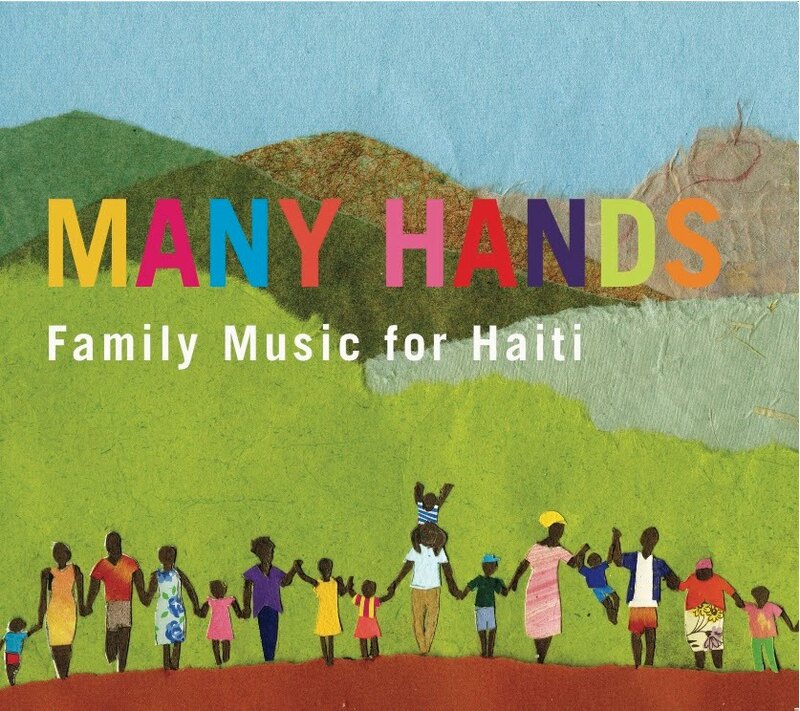 The proceeds (all the greater because everyone involved in the album's production, replication, and distribution either donated or heavily discounted their services) will benefit the Haitian People's Support Project, an organization with a long history of important work in the country. Knowing this is certainly one benefit to parents and kids who purchase this CD. But of course, you're also getting the best possible sampler of the cutting edge of today's kids' rock, pop, folk, and hip-hop. If your kids are already familiar with most of the artists, they'll be excited to get a new song from so many of them between new releases. (My five-year-old's favorites: "Fiddlehead Fern," by Recess Monkey, and "Quite Early Morning" from Seeger.) And if they're not, Many Hands offers the best single way I've seen to get a taste of so many of the genre's leading lights, all in one place, and find out which your kids (and you!) might want to hear more of. It isn't simply that the art is stunning, though; Thomson does a fantastic job of telling the story without a single word. 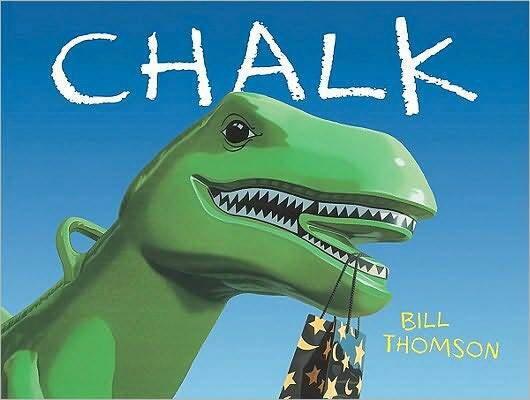 The result is a quietly masterful page turner of a picture book that, if my kids are any indication at all, will have yours obsessed in short order. 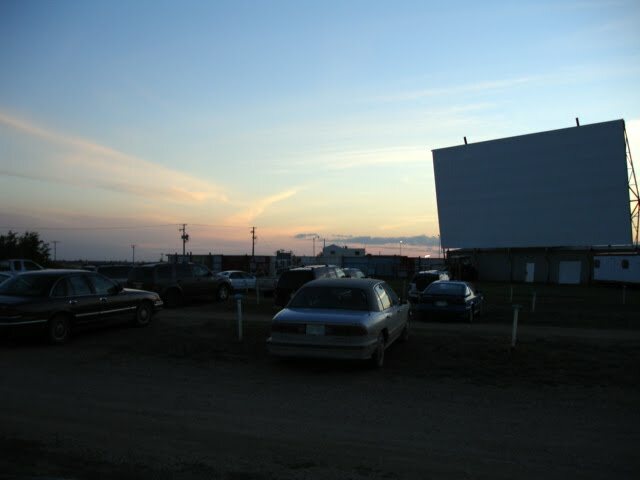 I'm really cheating in calling this an Old School, since I'd never been to a drive-in movie theater in my life before last week, and until recently I had no idea there were even any functioning ones left. My eyes were opened by my friends Joyce and Michael (the proprietor of the wonderful movie blog Cinema du Meep), and after some abortive attempts to attend one of the handful of options within relatively easy driving distance of NYC this summer, we wondered if there might be any drive-ins near the spot where we were vacationing in Rhode Island. As it turned out, there is one. (Well, it's on the other side of the state from where we were--but it's a really small state!) As seems to be the general practice at many of these places nowadays, you pay an entry fee to one screen there, at which two movies play each evening, usually a child- (and not necessarily adult-) friendly option first, and something R-rated second. With young kids, obviously, you generally just go for the first one, rather than attempting to get your toddler to shut his eyes and ears for two-plus hours of Inglourious Basterds. Now, this is not a review of the Cats & Dogs movie, though I will admit it wasn't as bad as I expected. (So nice to see Nick Nolte and Bette Midler working together again, even if the last time they actually had to be in the same place at the same time. And I'm always a sucker for a Wallace Shawn voiceover.) The experience of watching a silly movie with your kids in your parked car, though: This I give two thumbs up. Many more veteran families around us came better prepared, actually, parking their SUVs backwards and essentially tailgating for the film. But for our first go, we found it delightful just being enclosed together for the experience. It blew our two-year-old away in particular—his eyes got implausibly wide when he saw that giant white wall turn into a giant video. The whole thing was the perfect summer shared family experience. Plus, we got Sean Hayes's vocal impersonation of Hannibal Lecter. Truly something for everyone. I have always been envious of those natural storytelling parents, the kind who sit down next to their child's bed each night and invent rich tales full of memorable characters and exciting plot twists. On the rare occasions I've attempted this, I've found myself internally grasping at straws, with results that are both bizarrely random and overly fixed on getting to the next plot point. ("Once upon a time there was a...muskrat! And he lived in the forest next door to his best friend, a...sloth! And one day they awoke to find...the forest was on fire! So they rushed to...their other friend, an elephant, yeah...and he lived next to a lake, and he took the water in his trunk and put out the fire with it, and the forest was saved. The end.") At the abrupt endings of these tales, my sons tend to look more bemused than amused. 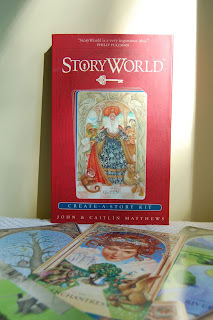 I had more or less given up, accepting that facile, spellbinding storytelling wasn't among my gifts, until I saw the new StoryWorld, by John and Caitlin Matthews. 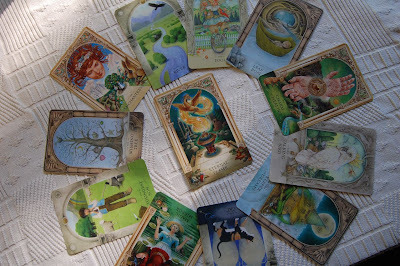 It's an originally British package of beautifully illustrated cards, very much in the style of tarot cards, each featuring a character ("The Mother", "The Youngest Daughter," "The Cat"), a location ("The Castle"), or a magical/potentially magical thing or place ("The Magic Mirror," "The Door to Faeryland," "The Star Blanket"). Each contains a few leading questions on the back ("Where is the cat going on this starry night? "), as well as a number of suitably ambiguous happenings in the background of the illustration on the front. The stories still don't tell themselves, of course. But I found these little crutches remarkably freeing the first time I tried: I wasn't grasping for the core characters and ideas of my story anymore, and so I could devote my (clearly limited) creative imagination to filling it out with descriptions and plotting. There's certainly a learning curve—I don't mean to imply I've been transformed into Elmore Leonard or something—but I can feel myself moving along it, rather than completely stuck in place as I was before. More important than my own storytelling education, though, is that my five-year-old is mesmerized. He's enjoying my stories from the cards, sure, but he's also been eager from the start to use these tools to engage in his own tales. Right now he's in the middle of a stretch where he's adding a couple of cards' worth of plot to a continuing story we both contribute to each night. Nothing like this ever happened before StoryWorld. I'm hoping we can both eventually reach a point where we don't need the cards anymore. (Dash is a lot closer than I am.) 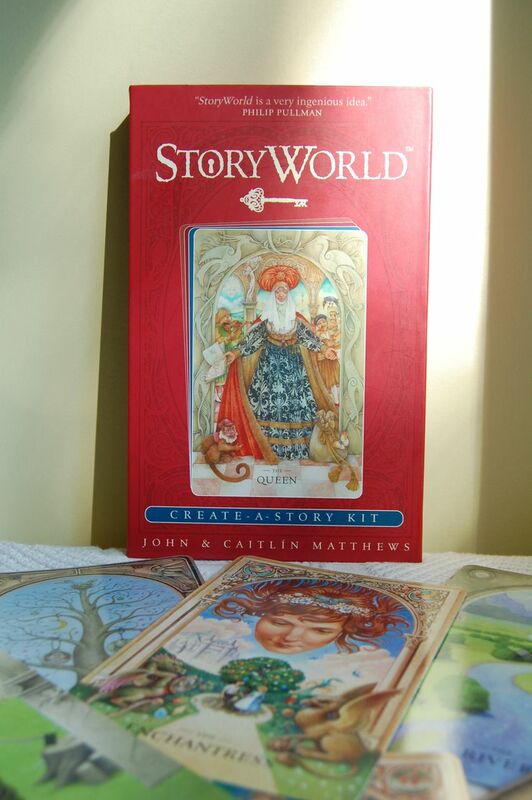 I'm optimistic, and if I'm right to be, StoryWorld will have taught us how to invent compelling tales at a moment's notice. While my son may have been on his way to that anyway (his mother is much better at it than I am, so he has those genes or environment, or both, working for him), I certainly wasn't, so I'll be forever grateful. 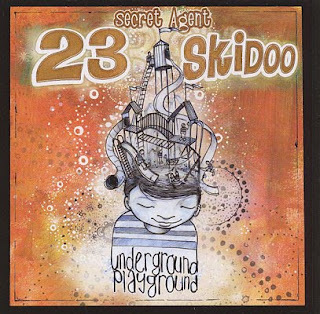 Most of the makers of kids' music I've written about here have been fairly established artists, with a proven track record of excellent CDs: Justin Roberts, Recess Monkey, Secret Agent 23 Skidoo (more on him soon, by the way). This is not a bad thing by any means; it's great to have so many musicians and songwriters coming out with music for children that you know in advance will be of high quality. But, as with any genre of music, it's always a special thrill to discover a great album from an artist who's new to you, one you can add to the personal canon. 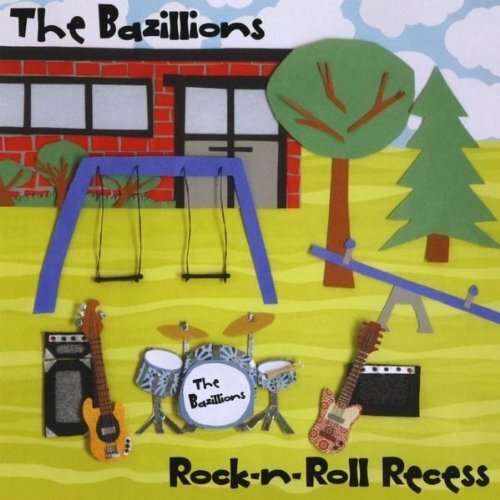 That's how I'd describe the debut release from the Bazillions, Rock-n-Roll Recess. The Minneapolis band's subject matter is standard kids'-universe stuff that children will glom onto easily—macaroni and cheese, friendship, messy rooms—but songwriters Adam and Kristin Marshall know how to create hooks that are irresistible to kids and parents alike. (I'm finding myself pleasantly addicted to the one from "Super Sonic Rocket Bike" these days.) The music is sunny, jangly, and remarkably catchy, and parents who were fans of bands like R.E.M. in their youth will feel very much at home when it's playing. 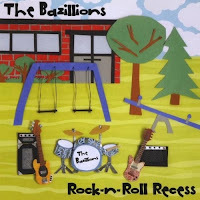 The Bazillions have also come up with something I haven't seen before on a kids' CD: They've included versions of two of their most appealing songs without the vocal tracks, so children—and, sure, parents too—can sing to the music by themselves, karaoke-style. (With these songs, they'll want to, believe me.) At first I cynically thought this was just a pad-the-CD gimmick, but now they have me wondering why more kids' bands don't do it. Well, maybe we will. But such considerations, in the end, don't have a prayer against the unbeatable counterargument: Think of his face when he sees it, and sees what it does. He's going to go crazy for this. And since he did indeed, we're feeling pretty good about the whole thing right now, though we know it's early yet. 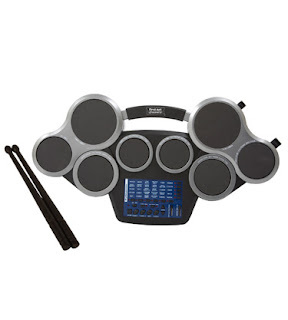 Most of me is still hoping this doesn't lead to a real drum kit in the basement in a few years, but you know what? Part of me hopes it does. Weird. I've been on vacation this past week-plus, and was extremely silly and thought I would post from here. Shaky Internet connections and a family not thrilled with the idea of nightly disappearances for that purpose have made this predictably (if you're not me, apparently) impossible. But I've been gathering fuel for new posts and will hit the ground running come Monday. I’ve previously mentioned the amazing New York Review Children’s Collection; most of its little-known classics I’ve previously encountered have been chapter books. But the company’s latest reissue is a 1969 picture book, in rhyming couplets. 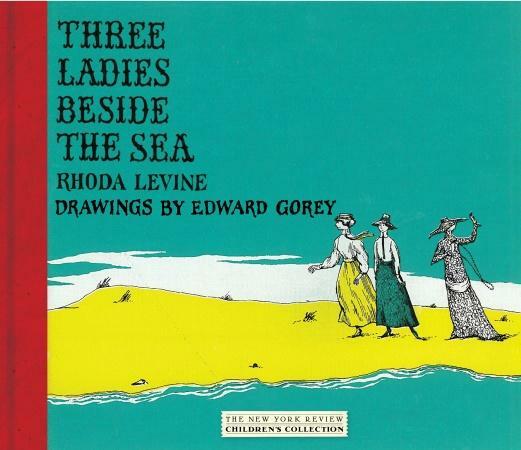 Oh, did I mention that the illustrations are by Edward Gorey? So it was with particular excitement that I picked up Three Ladies Beside the Sea. There was no guarantee that a similar surprise didn’t await within, but the slim volume, written by Rhoda Levine, didn’t have that look. That impression was correct—this book is aimed at fairly young children (though its charm and beauty will appeal to older ones too), and there’s nothing more shocking in it than a woman who often spends hours up in a tree. 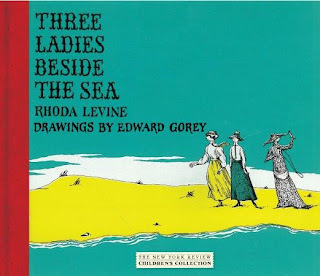 The story, as the title suggests, is of three elegant (this is Gorey, after all) women who live in neighboring houses by the ocean. Edith is happy and bubbly; Catherine is quiet but positive; Alice is pensive and distant. The three are friends, and even occasionally meet on the beach to play chamber music together. So Edith and Catherine are a bit worried about Alice’s habit of spending long hours in a tree, through all nature of weather, gazing at the sky as if searching for something. In sum, it’s yet another gem to add to the set the New York Review Children’s Collection has already accumulated.